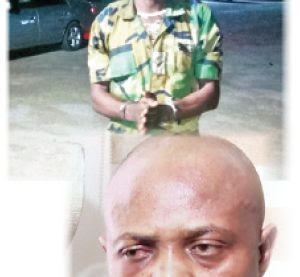 Lagos Police investigators are currently on the hunt for another serving soldier accused of working with Billionaire kidnap kingpin Chuwudumeje Onwuamadike, Evans. The army officer whose identity and rank is yet to be revealed was attached to one of the Army formations in Lagos. He reportedly fled after police arrested his colleague, Victor Chukwunonso in Ojo. Evans is a wicked man. God says there’s no peace for the wicked. Imagine this so-called billionaire kidnapping people feed them junks, put his victims through terrible trauma for SEVERAL months until they pay their way out. God does not accept mechanical repentance. Evans is not repentant from the heart even though his face looks remorseful. He’s only making a show of remorse because he has BEEN CAUGHT! He would have been kidnapping more people till this day if not that he has been caught. Why did he not turn himself over to the police voluntarily? Lazy and fake billionaire! Living large and receiving accolades from people on the suffering and fortune of hardworking Nigerians. Evans and his so called soldiers who work for him should face the wrath of the law. Amry and Police they have many bad eges amoung them, who work with Kidnappers, Cultis,Robbers or Boko Harams. not good uniform men, they should try to wipe them away,not only out of office, away from the earth.